Platelet Rich Fibrin Therapy (PRF) is a second-generation PRP where blood platelets and leucocytes are present in a complex fibrin matrix to help accelerate the healing of soft and hard tissue. Platelet rich fibrin contains, and releases through degranulation, several different growth factors and other cytokines that stimulate the healing of bone and soft tissue. The efficacy of certain growth factors in healing various injuries and the concentrations of these growth factors found within platelet rich plasma therapy are the theoretical basis for the use of PRP in tissue repair. The platelets collected in PRP are activated by the addition of thrombin and calcium chloride, which induces the release of the mentioned factors from alpha granules. The growth factors and other cytokines present in PRP include: platelet-derived growth factor, transforming growth factor beta, fibroblast growth factor, insulin-like growth factor 1 and 2, vascular endothelial growth factor, epidural growth factor, Interleukin 8, keratinocyte growth factor, and connective tissue growth factor. Platelet Rich Fibrin is produced from a person’s own blood. It is a concentration of one type of cell, known as platelets, which circulate through the blood and are critical for blood clotting. Platelets and the liquid plasma of the blood contain essential factors for the cell recruitment, multiplication and specialization required for healing. 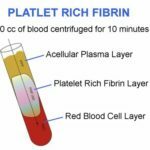 What is Platelet Rich Fibrin Therapy? A blood sample is obtained from a patient, the blood is put into a centrifuge, which separates the blood into its many components. Platelet Rich Fibrin therapy can then be collected before it is delivered to an injured area of bone or soft tissue. PRF is given to patients through an injection and ultrasound guidance can assist in the precise placement of platelet rich fibrin. After the injection, a patient must avoid exercise for a short period of time before beginning a rehabilitation exercise program. Platelet Rich Fibrin Therapy (PRF) is an innovative treatment option for relieving pain. Read more about what PRF is and how it might be able to help relieve your pain. Several studies suggest that platelet rich fibrin therapy can improve healing in soft tissue and bone. While the benefits of PRF, has mainly been seen in dental procedures so far, it is increasingly being used in other areas of medicine. These findings have led to the widespread use of PRF therapy for a variety of conditions, including soft and hard tissue repair. The most promising results with platelet rich fibrin therapy have been for the use of treating dental and periodontal concerns. PRF is a natural fibrin-based biomaterial prepared from an anticoagulant-free blood harvest without any artificial biochemical modification that allows obtaining fibrin membranes enriched with platelets and growth factors. Evidence from the literature suggests the potential role of PRF in periodontal regeneration and tissue engineering. The slow polymerization during centrifugation and fibrin-based structure makes PRF a better healing biomaterial than PRP and other fibrin adhesives. Who is a candidate for Platelet Rich Fibrin? PRF therapy is advised for patients with moderate osteoarthritis in the hip, knee or shoulder, as well as those with chronic tendonitis in the elbow or ankle. Typically the patient has failed conservative treatment options such as rest, medication, and physical therapy. Does PRF consist of one or more injections? The amount of injections is determined on a case-by-case basis. A physician will use the MRI or Ultrasound results to determine the number of injections. Typically a physician will suggest between 1 to 3 injections. Will there be a follow up? Yes, the physician will want to see you back to check the progress of healing. You will be asked to make a follow up appointment 6 weeks following the injection.